Welcome to the fifty-second Weeknight Dinner Recap! Wait, fifty-two? That's a full year! Yup, we've been recapping dinner for a full year here and I'm so glad you've been following along. I can hardly explain how fun it has been to transform dinnertime in our house as it has truly been an adventure in discovering new favorite flavors and a willingness to try (almost) anything that could be considered a plausible weeknight option. Not only have we expanded our dinner choices by a thousand percent (that's an accurate figure, right? ), but we have been able to hopefully introduce everyone reading to the countless options for dinner out there that can be made (or already are) gluten free. And that's the most important part! I'm so happy to share our dinners with you every night on Instagram and I'm even more excited to discuss them with you right here on Weeknight Dinner Recap. So, thank you for reading and let's get to the meals! Source: Tilapia recipe is from Half Baked Harvest by Tieghan Gerard. Eggplant recipe is from Myers and Chang at Home by Joanne Chang and Karen Akunowicz. GFMD: Conveniently, the fish recipe is naturally gluten free! For the eggplant, make sure to buy soy sauce and hoisin that are labeled gluten free. In regard to the dark soy sauce within the recipe, we just added a little brown sugar to GF soy sauce as a thickener. At this time, we haven't been able to find a GF dark soy sauce. If you have done so, then let me know! Outcome: We decided on this dinner because we received beautiful eggplant right from Seth's parent's garden. And of course we wanted to use it immediately so that it was at peak freshness. The blunder came when we decided the way in which we would cook the eggplant. While it wasn't a total misstep, I do admit to saying, "wow, that's a salty dish," more than once while eating. I'll also say that I didn't finish my meal. That never happens. On the bright side, we loved the sesame-crusted tilapia and we'll be making that again and again. Simple to prepare with delicious, crispy results, this fish was a great reminder that you don't need the fanciest seafood to make a really yummy meal. The eggplant was not a complete failure on any side of the process: I don't blame the recipe nor do I think Seth's cooking was in error. I just think that using a smaller amount of eggplant than the recipe called for did have an affect on the final dish (too much sauce, too little eggplant). I must also take a little bit of the blame burden because I somehow breezed past the note saying that this eggplant dish has a slight anise flavor. I'm not an anise fan. Are you? Just in the way I've never thought of licorice (yuck) as an actual treat, anise is a flavor I really don't like. So, lesson learned. Eggplant has many terrific uses in the food world and we have enjoyed it in a number of ways in various meals. Unfortunately, I may say we'll skip this one recipe from our beloved Myers and Chang cookbook in favor of the countless others that are more to our liking. That fish on the other hand will definitely be making a comeback. Source: A GFMD original recipe! That's right - you're not seeing a typo - we made this one up! With an abundance of summer squash, an affinity for pasta-and-stuff type meals, and the need for daily protein, this dinner came together in no time. We will share the full recipe with you soon! GFMD: Make sure to use your favorite gluten free pasta for meals like this one. 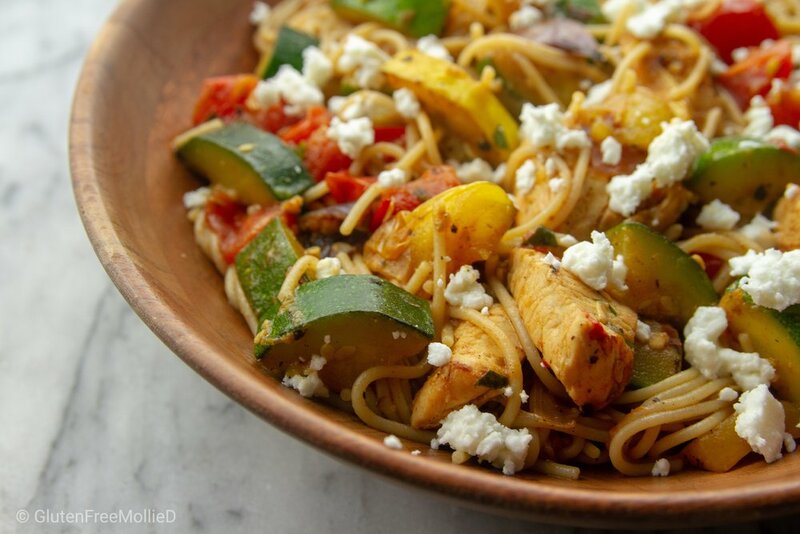 We used Jovial Foods gluten free capellini. Anything that reminds me of "angel hair pasta" will always be a win in my opinion. Outcome: What's more delicious this time of year than extra-fresh produce tossed with pasta and sprinkled with cheese? Not much! This dinner came together because we had lots of summer squash, tomatoes finally available from our balcony plant, and an urge for carbs that had to be squashed (I'm sorry). The result was a scrumptious dinner that we planned while we prepped. And cooking it all in the wok? Well, that was Seth's idea and I'd say it was brilliant. Wok-charred summer squash and chicken mixed with thin spaghetti (capellini) tasted like grilled everything, but without the grill! This was a summer pasta I know we'll make again especially when the ingredients are as fresh as these! While we will be sharing the recipe with you soon, here are a few notes: if you don't own a wok, then I'd recommend using a regular non-stick sauté pan to cook the chicken and veggies. The final flavor will be different, but you'll still have a delicious meal. 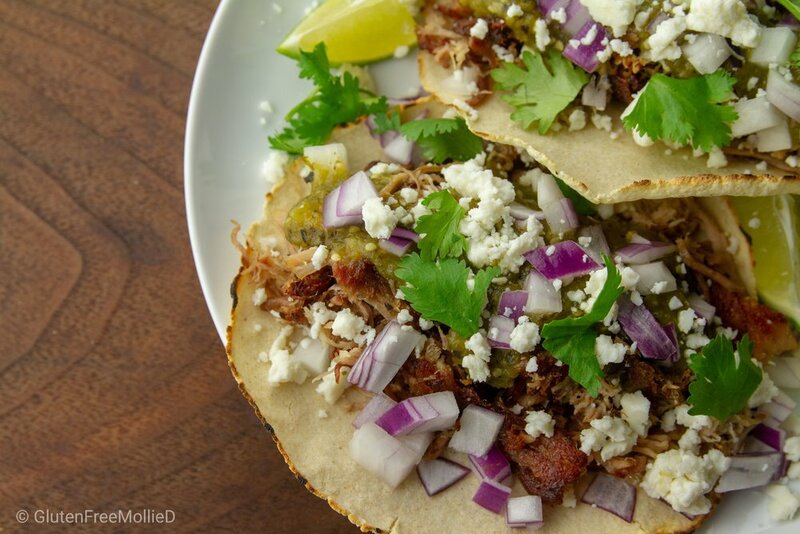 Source: The carnitas recipe is from Serious Eats online. Find it, here! GFMD: These tacos are entirely gluten free! The corn tortillas, pork, salsa, everything was all-natural and gluten free. No substitutions necessary and nothing had to be removed: it was all safe! Outcome: As I detailed on Instagram, we're often reminiscing about the heavenly pork carnitas tacos at Lone Star Taco Bar in Allston, MA. Not only are they one of the most delicious tacos ever, but ever since we moved further away from this taco hotspot we have been trying to make a similar version at home with at least a fraction of the amazing flavor. Using the sous-vide method, I think this time around we came absurdly close to our favorite carnitas tacos. The pork was cooked perfectly and then crisped in a hot cast-iron pan which not only amped up the flavor, but made it deliciously crispy. The longer you let the meat sit and crisp, the better your house will smell. So by the time it was ready, our home smelled fantastic and I couldn't wait to eat! 1. In a large bowl mix one and a quarter cups Masa Harina, one half cup warm water, and a big pinch of salt. 2. Knead until a firm, fairly dry ball of dough forms (you may need some additional water to get the dough to come together). 3. Cut the dough into six equal pieces, roll each into its own smaller ball and cover with a damp towel. 4. Heat a tortilla-sized cast iron pan over high heat until it smokes. Super hot! 5. Using a gallon freezer bag with the zipper and one seam removed to keep the dough balls from sticking to the tortilla press, press the ball repeatedly, rotating between presses until you have a thin, even disk (it should look like a tortilla). 6. Place one tortilla in the pan and cook until you are done pressing the next (in my experience this timing works well, but yours may vary, so keep an eye on it) then flip and allow to cook until the very edge starts to blacken slightly. 7. Keep the completed tortillas warm by wrapping them in a clean dry dish towel until you are ready to use them. When you’re ready to make your tacos, the tortillas will be warm and ready to be filled! GFMD: This recipe was entirely gluten free. No substitutions or changes necessary! Outcome: As part of our partnership with Wilson Farm, we made this scrumptious soup to promote their Corn Festival which took place over the weekend. Wilson's own corn is picked fresh daily and is the perfect sweet treat for late-summer dinners. We've used it in a variety of meals as a side dish, but this time around we made it the star. What I enjoyed about this soup (besides it just being really great) was the inclusion of salsa verde and fresh tomatoes as topping. The corn flavor was kicked up a notch by the brightness of the salsa which also added a nice green color to the dish. The sliced tomatoes were a fun bite amidst the soup that did have some corn kernels amidst it, but for the most part was quite smooth. It's a shame sweet corn has a pretty short season. I would definitely make this all year long; technically that's possible, but I am sure frozen corn would never taste quite as incredible as fresh - especially in soup! Thursday: Surprise! We went out to dinner on Thursday after a really busy day and desire to just unwind. Sometimes you need that, right? Without too much thought, we jumped in the car and had an easy, low-key dinner at Red Heat Tavern. I had a delicious Mediterranean rice bowl with veggies, chickpeas, and grilled chicken and Seth had a chicken sandwich. Fairly standard fare cooked well and presented nicely - perfect for a quick dinner out! I must admit I was too tired to take photos and sometimes just feel like skipping them. 😮 We had a great time and re-charged a little before finishing out the week. Source: This recipe is by Claire Saffitz for Bon Appétit. You can find it, here! GFMD: Another naturally gluten free recipe! No changes needed for this one. Hooray! Outcome: What a delicious meal to close a week and start the weekend! We went for a walk to start the night, then came home and had this joyful plate. Filled with veggies and crispy fritters, this dinner was a visual interpretation of how I lead my life: the cucumber salad represented the aim for healthy meals most of the time and the crispy fritters represented the weekend - you need to have some fun! Add in my favorite yogurt sauce and voilá! One awesome dinner. What I loved about this dish was that it was a terrific mix of flavors that complimented each other so well. We’ve made a number of meals from this recipe developer and they’re a wonderful balance every time. She knows her stuff! Crispy fritters, bright, fresh greens, and a creamy-with-a-bite yogurt sauce will always be a plate that’s destined for dinnertime success. Grab the recipe (above) and try this one out tonight! Weekend: You know, it was a very rainy weekend. So rainy, in fact, that on Sunday morning we stayed in half the day because the downpours were so intense! I couldn't believe it. However, the rainy days didn't stop us from the usual weekend activities, plus a little birthday shopping, and a couple delicious meals out. Yes! My birthday is coming up and I'm pretty excited. Athens lazing around, watching the rain. She loves to lounge! Many folks aren't always too happy about birthday-celebrating, but I've personally always loved it. While I wasn't the most enthused on the concepts of turning 25 (a while ago), and then 30 (a little more recently), I would say life has gotten much better, and way more fun, with the passing of each of these "big" ages. Here are a few highlights of the weekend! Saturday (and Sunday) morning breakfasts made with a few leftovers from the week. - Enjoying a beautiful walk Friday night, sunset and all, before cooking at home and having a truly relaxing evening. It's rare that we cook on Fridays, but I'm thinking this may need to be a new ritual. I woke up on Saturday feeling rested, refreshed, and ready for fun! - Having some quality family time on Saturday and eventually getting dinner together at Lexx Restaurant, which has a been a great, local spot for many years. The menu has everything clearly marked "GF" and there are even some dessert options! I have a rotating selection of my favorite dishes, but this time around I went for the hummus plate with veggies then the jambalaya for dinner. So good! And quite satisfying. I had not had this meal in a while so it really hit the spot. Hummus plate with veggies and goodies. - A late lunch on Sunday at Legal Sea Foods in Chestnut Hill watching the Red Sox game and pretending that the weekend wasn't ending. We've gotten into the (luxurious, in my opinion) habit of going out to lunch on Sundays and while it kind of eats away at our "productivity time," it definitely encourages a more laid-back mindset to keep in check for the rest of the day. A sunnier moment from Friday evening. Sunday evening was the usual laundry, cleaning, organizing, and eventual dinner (or leftovers, in our case). Our cat had been mesmerized by the rain all day and eventually we found her sleeping in between the couch-cushion-edges. Her favorite! We hope you had a wonderful weekend and had time to re-charge, rest-up, and get excited for the new week. Cheers to a full year recapping our dinners and sharing all that's gluten free and delicious with you!